The Chelsea MA Summer Show is just around the corner, and during the hustle and bustle of the set-up week, we asked MA Textile Design student Patricia Hegarty how she is getting on with her final preparations. The MA Summer Show opens in a few weeks’ time, how are you finding the setting up and preparation for it? It’s an exciting time, getting ready for the exhibition. It’s really positive to see everything coming together, especially the culmination of all my research over the past ten months (as well as the research and application process that led up to the start of the course last October). It’s very busy right now, of course, but coming along nicely. It will be a relief when we submit for assessment. There are many aspects to co-ordinate and decisions to be made every minute during the preparations and set up – about finishing touches, display and defining a clear narrative for the work. No matter how organised you think you are or how much of a vision you have for the show, there are still elements that you’re deciding or changing on the spot – but that adds to the excitement and energy of the project. What specific words would you use to describe your practice? What can we expect from your MA Textiles show? The show illustrates this past year’s research and practice. The project, Non-toxic Textiles investigates concerns around toxic chemicals used in the textile industry. The aim is to eliminate their use from my design practice. 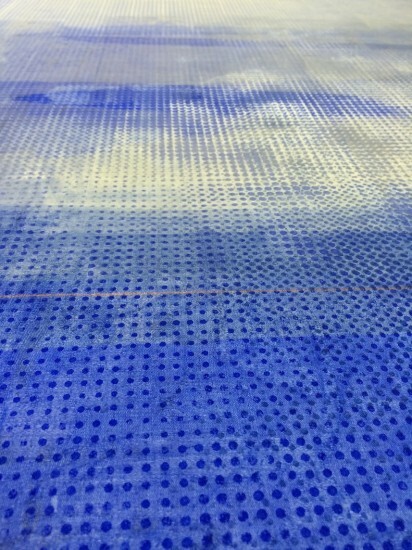 The process interrogates the use of patterns and the impact of robust dyes and aggressive washing patterns. The work addresses issues of safety and protection in cloth and the lack of safety or protection of the natural environment as well as the changing ethics of today’s textile landscape. The practice utilises heirloom linen which is a comment on globalisation, colonisation and the current ethical and environmental issues around the cotton industry. I am working with a mineral-based pigment printing method for a clean practice. And thereby illustrating the polarity between washing and cleanliness, ultimately questioning our concepts of ‘clean cloth’. The exhibition highlights the processes used throughout my research, illustrating the concerns through a graphic presentation and the processes in their textile outcome. I draw upon ideas of the use of fibre, for certain climates, and explore conceptually different ideas of wrapping and protection and the need to be safe. You were awarded the Neal’s Yard Remedies Scholarship 2014/15, what did this scholarship enable you to do? The scholarship has awarded me the invaluable opportunity to invest all my energies and time in the research and work for the project. Without this scholarship, I would not have had the means to achieve such success in the MA. I am extremely grateful to Neal’s Yard Remedies for their generous contribution to my studies and progression. What is your favourite skill you have learnt whilst at Chelsea? While at Chelsea, I have developed strong independent and collaborative research skills, investigation and analysis of technical, conceptual and theoretical aspects of textile design. Involvement in projects through Textile Environment Design, such as Elastic Tools and Culture of Resilience, have been excellent opportunities to develop and utilise these skills. Finally, for our students beginning this September, do you have any advice? Have a clear agenda of what you intend to achieve in the ten months. Have a self-directed plan of action for Unit 1, don’t wait around. Say yes to every opportunity that presents itself, no matter how busy you think you are… you never know where it might lead. See more of Patricia’s work on her website, Dots portfolio, Instagram and Twitter. Find out more about the MA Summer Show. Find out more about the MA Textile Design course on our course page.